This post has 5,508 views. A few days ago I went on another day trip to explore places near and around the Vacouver region. I will be leaving the area to study in the US soon, so these are the last few weeks that I have to get to know British Columbia a little better. This time I went the Sunshine Coast, an area composed of several small towns/villages that’s located northwest of Vancouver. As a resident of the Metro Vancouver area, I keep hearing about the term “Sunshine Coast” but before the trip I didn’t really know where the Sunshine Coast was. Just likes the trips to Sydney (Vancouver Island), my relatives and I fished and crabbed during the trip, and below is the record of that day. 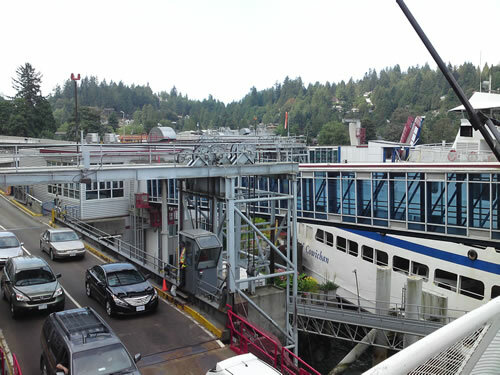 The Horseshoe Bay Ferry Terminal. The overhead walkway from the terminal entrance to the ferries was quite the lengthy stroll. To get to the Sunshine Coast, first we had to go to the Horseshoe Bay to take the ferry to Langdale, aka the entrance to the Sunshine Coast. The Sunshine Coast is technically connected to the mainland, but due to the geography it’s much faster to take the ferry. Going there via road takes over 2 hours as you have to drive up north and go the long way around, but the ferry takes only 30-40 minutes. Ticket prices for the ferry was $12.60 for an adult round trip, and funny enough tickets are only sold on the Horseshoe Bay end. You only need to pick up a boarding pass when returning and I didn’t spot any ticket booths at the Langdale terminal. The top of the Queen of Surrey which carried us to Langdale. 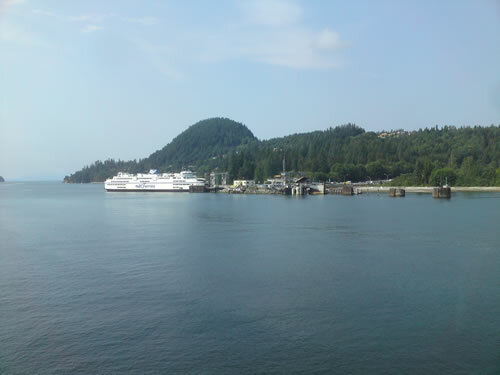 The Horseshoe Bay – Langdale route is serviced by a couple of Cowichan Class double-ended ferries. 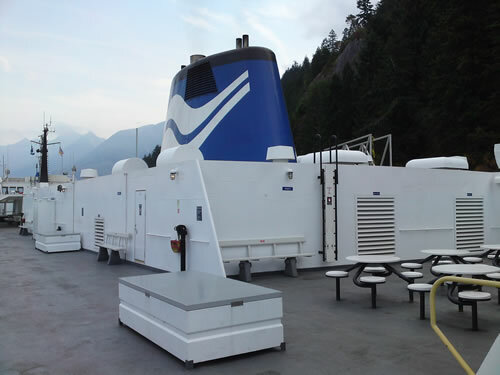 They are not quite as big or new as the ones that serve the Tsawwassen to Swartz Bay route, but they are still pretty big as far as BC Ferries go. 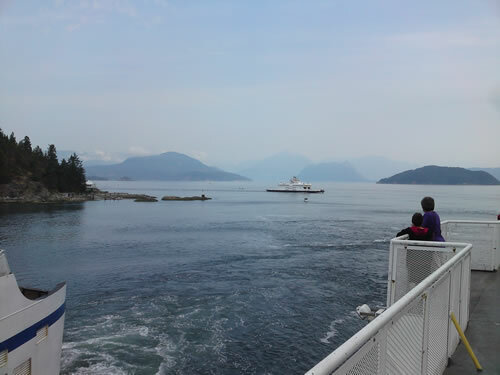 The ferry trip is relatively short, but fairly scenic as you can get a good view of Bowen Island and the other coastal features of the area. The view from on top of the ferry at Horseshoe Bay terminal. As I mentioned before, Langdale is the beginning of the Sunshine Coast area, but it’s not our planned destination for the day. 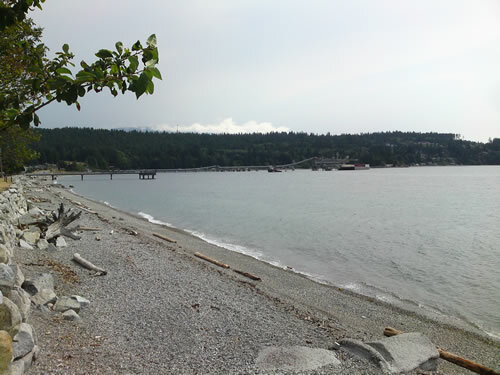 We wanted to go to Sechelt, which is located about 30km further west of Langdale at the “centre” of Sunshine Coast. There is the No. 1 bus that goes from Langdale ferry terminal to Sechelt, but it takes about an hour as the route frequently goes into residential areas. 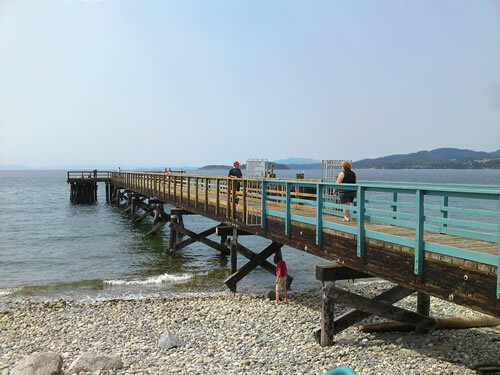 A shot of the first pier we went to at Sechelt. It's the smaller, darker one in the foreground to the left. The view from the first pier we went to. I thought the sky was a bit blurry that day, but this picture didn't turn out too badly. One of the little soles we caught at the first pier. Way too small to cook. We rode the bus to its final stop near a shopping centre, and behind the shopping centre was a trail and a pier. 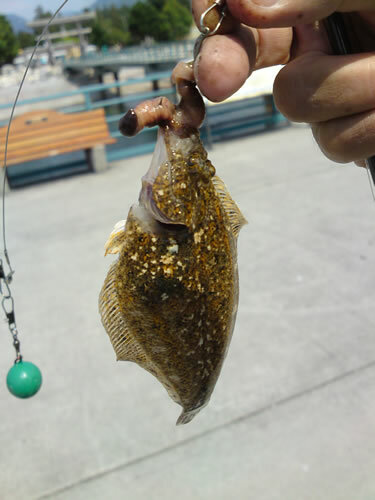 There was nobody on the pier, and the water below looked shallow, but we decided to give the fishing a try. In the span of half an hour or so we hooked three soles, but they were all tiny (~10cm long). Therefore, we decided to take the bus back a few stops to another pier. This second piers already had a few people fishing and crabbing on it, but what’s more there were a lot of kids playing on the pier jumping in to the water. It was a warm summer day, and the kids were out to play. All the people on a small pier created a somewhat hectic scene, but despite the kids playing in the water there were quite a fishes around. At the end of the day, we caught two decent sized soles. There was a gentleman fishing beside us and we saw he catch four or five soles, one of them being pretty big (well over a foot long). Another elderly gentleman caught two legal-sized Dungeness crabs, but we didn’t catch any crabs that day. Our fishing and crabbing venture wasn’t too successful that day, but at least we didn’t come back empty handed. 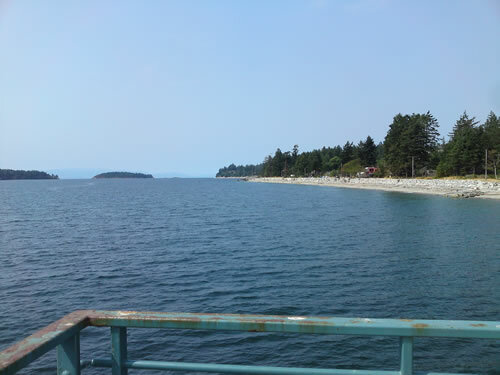 The second pier that we went to at Sechelt. This is where all the fishes, crabs, and kids are. Other than fishing and crabbing, I also tried taking in the scenery. Shape-wise, the Sunshine Coast looks as good as any of the other BC coasts I’ve seen. However, the sky was a bit blurry despite it being sunny and warm, and there was fog/smog/smoke in the distance so the colours weren’t very sharp. The area probably looks more beautiful under blue skies. Overall, my day trip to the Sunshine Coast was a good experience. The scenery wasn’t as good due to the weather, and we didn’t catch that many fish or crabs, but at least I went to a place I’ve never been before. I probably have time for one or two more day trips before I leave for the States, so hopefully there will be another trip coming up soon. Glad you had a great trip to the Sunshine Coast. Yes, the haze you experienced was do to the forest fires near Lillooet. Normally the skies are clear and blue and the water an even deeper blue. Come back again when you can take in a festival or some of our great hikes. Skookumchuck Narrows is a treat not to be missed. Yeah, I thought the sky looked hazy. Thanks for the explanation. Hopefully the rain on Saturday will help a bit. Hey TJ, I am glad to hear you had a great time on the Coast. It is great that you post your experiences and pictures as the Sunshine Coast is truly a hidden gem that is great to share. I wanted to let you know of a contest that involves writing about your BEST West Coast Experience, go to http://www.distinctlywestcoast.com and enter on August 30th, and you could come back and see the coast not only by sea, and land but also by air! Tofino Air will take you to Vancouver Island for the second part of the trip which starts on the coast and includes kayaking, snorkeling and caving. We hope you enter the contest and feel free to tell others who have experienced the coast. Have a great time studying in the US. Thanks Teressa, and good luck with the contest you are running. I’ve never kayaked, snorkeled, or caved before, but hopefully I will some day.